Last week I fished with my 3 favorite fishing buddies. My wife Crystal, her son (my stuff son) McKee, and T-Bone who is still unborn. 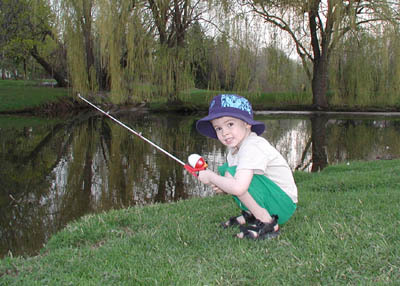 We fished at Larkin Creek Pond. McKee hadn't cast a line in many months. He asked me "Stuff Dad. How do you do this?" I showed him and before I could finish my sentence he was grabbing for the rod. His excitement for fishing made me proud. 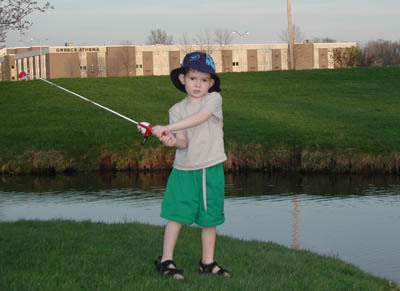 He took the rod and started casting. I didn't help him at all after that for the rest of the night. I was surprised and proud that he was casting so well. He must have been spending every night over the last few months just perfecting his cast in his dreams. He has done so well that I might even have to add a hook to his line next time we go.